TREAD ROLLERS: 1.9″ dia. to 1-3/8″ dia. x 16 ga. tapered rollers, model 138T; 1-3/8″ dia. x 18 ga., model 138G w/ 5/16″ hex, galvanized straight tangent rollers. ROLLER CENTERS: 1-9/16″ measured at inside radius of unit. TANGENTS: 12″ both ends on 90 degree unit; 18″ both ends on 45 degree unit. 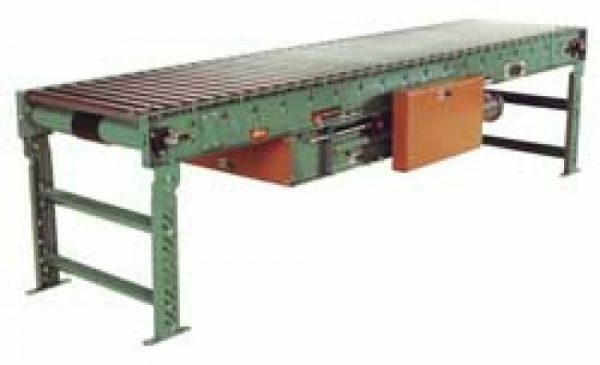 BED: 6″ x 1-1/2″ x 12 ga. formed steel channel frame. MOTOR DRIVE: 1/3 HP, 230/460/3, 60 cycle, ODP right angle gear motor, located at infeed end of curve below bed. DRIVE LOCATION: Drive located on outside of curve. Specify left hand tangent length, right hand tangent length and drive location (“left hand drive” or “right hand drive”). NOTE: Drive hand determined with reference point located at outside of curve. For models slave driven (less drive), specify drive shaft location. CAPACITY: 300 lb. total distributed live load. 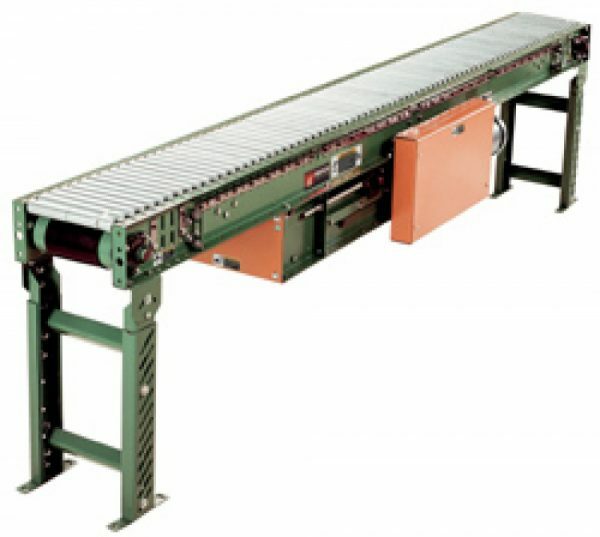 TANGENTS: 12″ both ends on 60/30 degree unit; 18″ both ends on 45/45 degree unit. 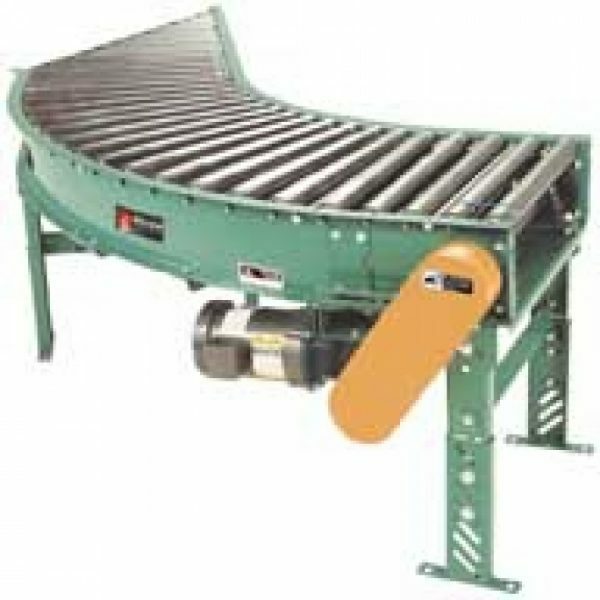 CENTER DRIVE: Reversible drive w/ 24″ integral belt take-up. Specify location. TREAD ROLLERS: 1-.9″ dia. x 16 ga. steel rollers, model 196S. PRESSURE ROLLERS: 1.9″ dia. x 16 ga. steel, model 196S, cam adjustable. FLOOR SUPPORTS: SM-6 adjustable 31-1/2″ to 43-1/2″ TOR. Supports should be lagged to floor. TREAD ROLLERS: 2-1/2″ dia. to 1-11/16″ dia. x 14 ga. steel tapered rollers, model 254T; 1.9″ dia. x 16 ga. steel straight tangent rollers, model 196S. TANGENTS: 1′-0″ both ends on 90 degree; 1′-6″ both ends on 45 degree; 1′-0″ both ends on 180 degree. Tangent roller centers provided on 3″ RC. BED: 7″ x 1-1/2″ x 12 ga. formed steel channel frame. CAPACITY: 500 lb. total distributed live load. MOTOR DRIVE: 1/3 HP, 230/460/3, 60 cycle, ODP right angle gear motor, located at infeed end of curve below bed on 45 degreeand 90 degree curves; 3/4 HP supplied on all 180 degree curves. SPECIAL WIDTHS: Consult factory for pricing of ALL widths not shown. TANGENTS: 12″ opposite spur end on 60/30 unit; 18″ opposite spur end on 45/45 unit. TREAD ROLLERS: 2-1/2″ dia. x 11 ga. steel, model 251S. PRESSURE ROLLERS: 1.9″ dia. 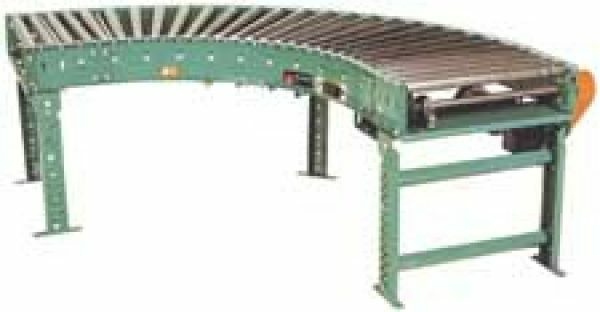 x 16 ga. steel, model 196S; same BF as conveyor up to 39″ BF; units 43″ BF and above, rollers are 21″ BF with STANDARD 12″ wide belt; 27″ BF if OPTIONAL 24″ belt is used. 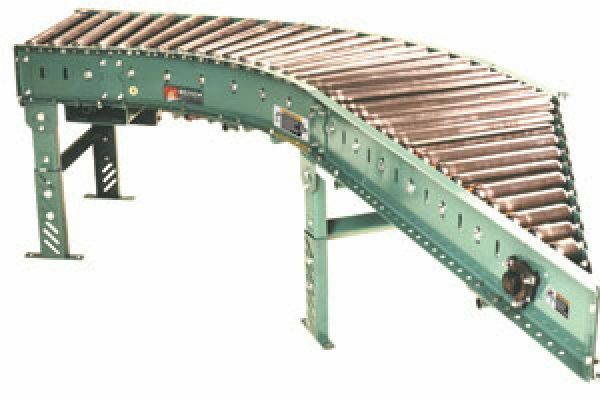 CENTER DRIVE: Reversible drive with 24″ integral belt take-up. 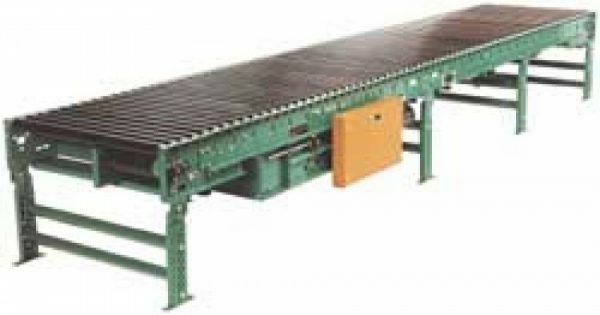 For units under 8′-0″ overall length, drive components must be stacked. END PULLEY: 4″ dia. with 1-3/16″ dia. shaft on 15″-39″ BF; 6″ dia. with 1-7/16″ dia. shaft above 39″ BF; both crowned. DRIVE PULLEY: 8″ dia. with 1-7/16″ dia. shaft on 15″-39″ BF; 12″ dia. with 1-15/16″ dia. shaft above 39″ BF; both crowned and fully lagged. BED: 7″ x 1-1/2″ x 10 ga. formed steel channel frame slotted for tread rollers to pop-out. 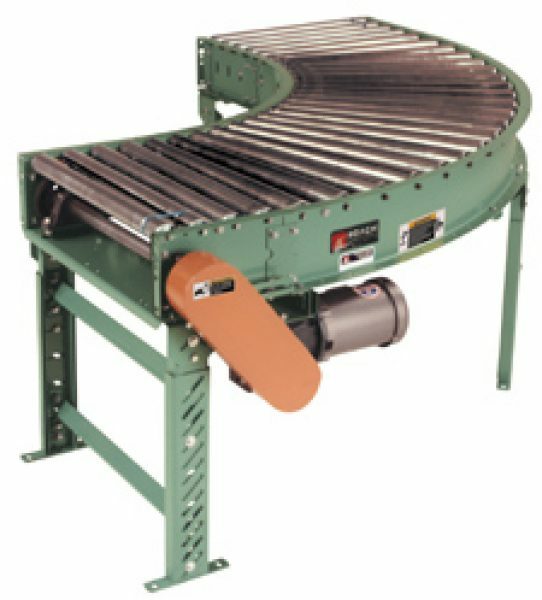 When unit is installed at 7′-0″ elevation or higher, rollers must be retained in conveyor frame. Specify desired elevation. Bed sections attached with couplings and floor supports. FLOOR SUPPORTS: 8″ and 12″ center drive (with 4″ or 6″end pulley) adjustable 33″ to 36″ TOR with SH-6 at end plates and SH-7 at intermediates. Supports provided on 5′ centers and should be lagged to floor.